Scale wing struts constructed from airfoil-shaped aluminum and factory-painted to match the real thing. Scale factory-assembled scale landing gear with simulated bungies and smooth shock absorption that makes touchdowns light as a feather. Genuine Hangar 9® UltraCote® covering designed to capture the classic scale lines of a full-scale Cub owned by Pat Hartness. All these scale features and more on a realistic-looking airplane that’s ready for Sunday morning cruising. 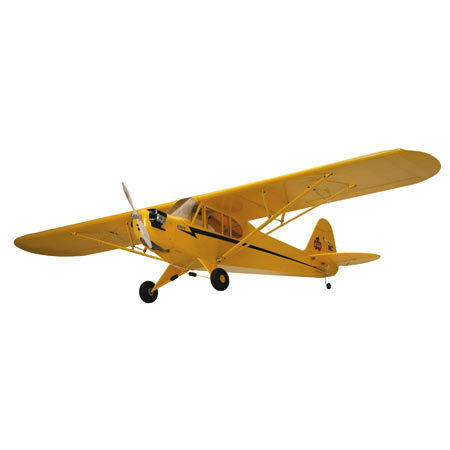 Hangar 9’s new .40-size Piper J-3 Cub ARF captures the classic scale lines and smooth flight performance of its grandfather, a full-scale Cub owned by Pat Hartness, whose Triple Tree Aerodrome hosts the annual Joe Nall and Don Lowe Masters RC model events. 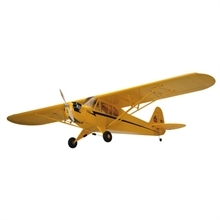 Constructed from top-quality balsa and lite-ply materials and showing off a vibrant Cub Yellow UltraCote® scheme, this scale Cub will provide aviation buffs with hours of sport-flying fun.